We are a lively, welcoming and inclusive church worshipping within the 'catholic ' tradition of the Church of England. 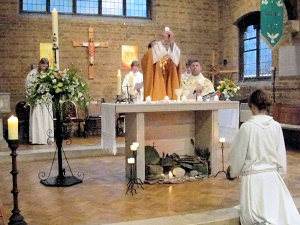 Worship at Saint Luke’s emphasises Christ’s glory: Our services are bright and colourful, and appeal to all the senses! Several parts of the Sunday Service are sung, the priest wears bright vestments, and incense is used to symbolise our prayers rising up to heaven. All these things try to reflect the glory and mystery of God. Much of this might seem strange, but we are a very friendly and welcoming church. Please ask anyone near you to help if you ‘get lost’ following the service!